Liz Sexton-Kennedy, a computing architect at Fermilab, remembers watching Powers of Ten when she was in middle school. The film, which explored physics at the very largest cosmological scales all the way down to elementary particle physics, ignited her interest in the field. Fermilab was the perfect place to investigate those extremes, and now Sexton-Kennedy’s career has led her to a new leadership role. In April, Sexton-Kennedy took on the position of Fermilab’s chief information officer. As CIO, she is responsible for both the scientific computing and information technology for the lab. While an undergrad at Rutgers University, Sexton-Kennedy’s interest in physics at the smallest scales fueled her involvement in a summer program at Fermilab where she worked shifts on the E619 experiment, mounting magnetic tapes for taking data and learning about the physics of the experiment. a. After completing graduate school, Sexton-Kennedy spent some time teaching at a community college in San Diego, but found herself craving the intellectual excitement that she got from doing research. She decided to move back to Fermilab to see if any positions were available. In 1988, after working a temporary job in the Physics Department, she ended up accepting a permanent position with the CDF Data Acquisition Group, which was looking for somebody with a physics background who was enthusiastic about learning about the computing side of things. By 2002, Sexton-Kennedy had worked her way up to the head of the offline software and computing group at CDF. In 2005, she was asked to lead a project to completely rearchitect and redesign the offline software for the CMS experiment at CERN, a shift from an experiment management position to a deep dive into the technical aspects. By 2010, she was asked to become part of the executive team of the international CMS collaboration. Sexton-Kennedy’s experience as the current CMS software and computing coordinator has prepared her for the scientific computing aspect of her CIO role. She recently presented her vision for how scientific computing will evolve over the next decade, projecting the big data needs for current and upcoming experiments, particularly at CERN’s Large Hadron Collider. 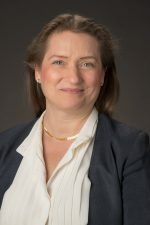 She is also working closely with her colleagues in the Core Computing Division to determine its priorities and direction in the information technology area. A focus for this division, she said, is cybersecurity. Sexton-Kennedy said she is looking forward to setting a vision for what the computing sector will look like in 10 years and making sure that the lab is on the right path to get there.